The Sustainable Breakfast Series at Friends of the Earth Food Cooperative was dedicated to taking the SUS out of Sustainability. Held from 24-28 March 2014, the broadcasts were live all week from the Friends of the Earth Food Coop on Smith Street in Collingwood. We were joined by many of the volunteers and campaigners at FoE and other guests working towards creating a sustainable future. The Sustainable Breakfast Series was supported by the City of Yarra. Beth from the FoE Food Co-op was our first guest. For over 30 years FoE Food Co-op has been providing affordable, low packaged (bulk) food, fruit and vegetables, health and eco-cleaning products. We then spoke to Shaun Murray, FoE campaigner against new coal mining. Nick Ray tells us about the Ethical Buyers Guide & Local Harvest Challenge. Felicity Milner from the Environmental Defenders Office gives a view of the important work of her office in the legal battle for our environment. Val Nagle from the YarraBUG's radio program talks about bicycles in the urban environment. Les Thomas local musician plays for our listening pleasure. Sandi a worker at the FoE Food Co-op shares her knowledge. Check out her blog for recipes ThreeBowls.com.au, Gem Romuld & Crunch from FoE's Anti Nuclear Collective tells us about their Radioactive Exposure Tour. Patrick Lawrence ( Director - Aid Pillar) tells us about a new initative at the Asylum Seekers Resource Centre - the Food Justice Truck. Amandine Francette from Food Not Bombs tells about their important work on the streets of Melbourne and Sharelle Polack from Cultivating Community tells us about how community gardens figure in the urban landscape. We hear music from Black Orchid from West Papua. Cam Walker Campaign Director at FoE gives us a view of FoE's history and key campaigns followed by Leigh Ewbank from the FoE Renewables campaign. Chris Ennis - manager of the organic farm at Ceres in Brunswick tells us about Ceres Food Miles Report and Fair Food. Alex Fearnside from Urban Coup gives us an idea about intentional community living in Melbourne and the wonderful Luke Sinclair from The Plastic Knife Band supplies music and information about the world of zines. The remarkable Madeline Hollyburton from Madeline's Eggs tells about how a young woman builds an organic egg empire. Dave Kerrin & Matt Harrington tell us about a workers' co-op called Earthworker. Hayley Morris from Sustainable Table tells us about their no waste initiative and Dr Paul Sinclair tells us about Meat Free Week. Our final guest today was Michelle from the Rising High Studios a Yarra Council Youth initative who gives us a fantastic dose of original hip hop. Ian Penrose & Paul Prentice tell us about river care in our local community including the Yarra River and the Merri Creek. Matt Clare, a student at Melbourne University talks about the campaign Fossil Free Melbourne University‎. Keith Fitzgerald & Cathy Drummond from the EastLink Community Picket tell us about how they are working to save the intergrity of our suburban communities. Victoria Ryle from Kid's Own Publishing tells about their work bringing the stories of children and others to the community. Our last guest is Laura McFarlane who gives us a final dose of live music. Together with Friends of the Earth, 3CR Breakfast programmers present a series of live shows with delicious free breakfasts from the FoE Food Coop and Organic Cafe at 312 Smith Street Fitzroy. Each year in March, join us for a week of live, local radio in the City of Yarra, a delicious free breakfast and great local music. The Sustainable Breakfast Series is in its third year on-air from Tuesday-Friday, 15-18 March, 7am-8:30am. Where: Friends of the Earth Food Co-op and Organic Cafe, 312 Smith Street, Collingwood. When: Tuesday-Friday, 15-18 March, 7am-8:30am. Supported by the City of Yarra and Friends of the Earth. The Sustainable Breakfast Series is on again following on from last year's delicious success with radical radio, a delicious free breakie and live local music. Join the live audience and hear discussions from 3CR breakfast presenters on local sustainability issues, from setting up cheap renewable energy and workers co-operatives to urban agriculture and building resilient communities in the Yarra area from Monday-Friday, March 23-27, 7am-8:30am. 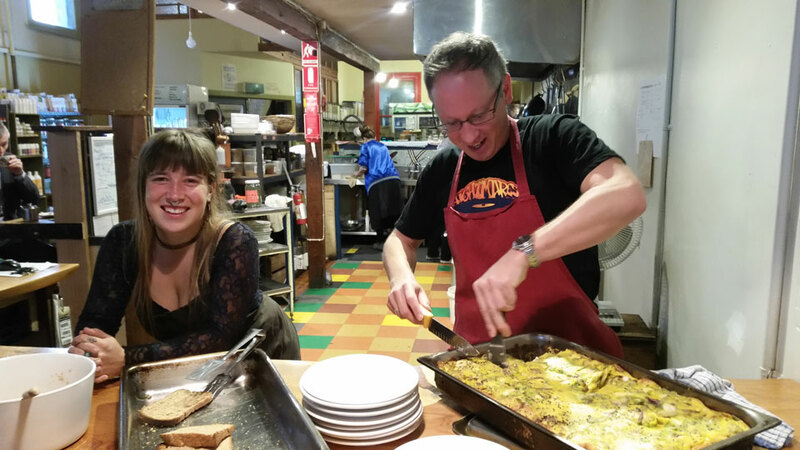 The Sustainable Breakfast Series at Friends of the Earth Food Cooperative was dedicated to taking the SUS out of Sustainability. Held from 24-28 March 2014 the broadcasts were live all week from the Friends of the Earth Food Coop on Smith Street in Collingwood. We were joined by many of the volunteers and campaigners at FoE and other guests working towards creating a sustainable future. The Sustainable Breakfast Series was supported by the City of Yarra.